The Centennial Flame sits in the foreground of the Centre Block with Peace Tower of the Parliament Buildings, Parliament Hill, City of Ottawa, Ontario, Canada. The Centennial Flame sits on the walkway that leads to the Centre Block of the Parliament Buildings sits majestically in the background of on Ottawa’s Parliament Hill. 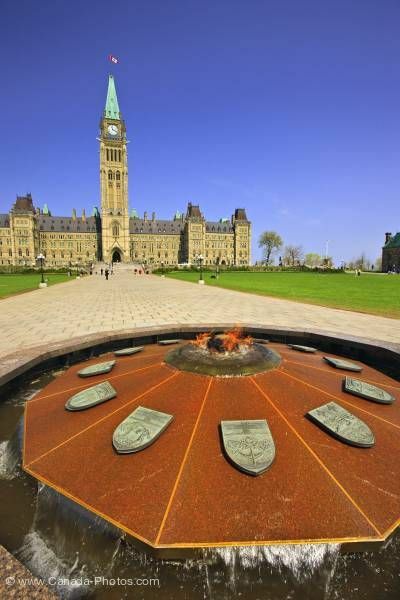 The Centennial Flame is surrounded by a metal dome that displays metal plaques along with a water fountain. Please let me show you more of my pictures from my "photo gallery: Parliament Hill Photos". Pictures from photo gallery "Parliament Hill Photos"